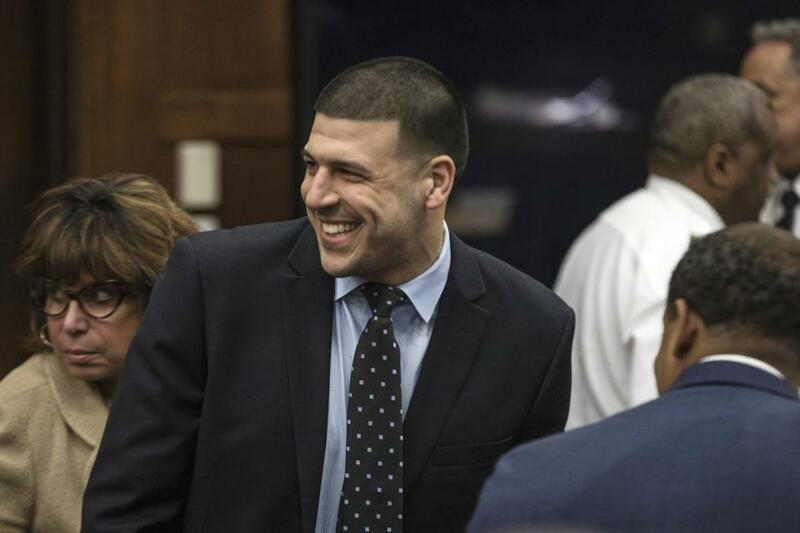 Aaron Hernandez smiled at his fiancee and their daughter during his double-murder trial at Suffolk Superior Court in Boston on April 12. Aaron Hernandez pleaded with prison officials to share a cell with men he said were like his “brother” and his “heart,” letters he wrote while behind bars show. In one letter, dated June 12, 2015, Hernandez wrote to a deputy that he was hoping to be moved to another part of the prison “where I belong.” He wrote that he was also requesting to “celly up” with another inmate, whose name is redacted. The five letters, obtained by the Globe, were authenticated by state officials. In one undated letter, addressed to IPS, the Department of Correction’s Inner Perimeter Security unit, Hernandez seeks to dispel what he calls “false gossip,” though the nature of the gossip is redacted. The former New England Patriots star was serving a life sentence for the 2013 murder of Odin Lloyd when he was found hanged in his cell April 19. 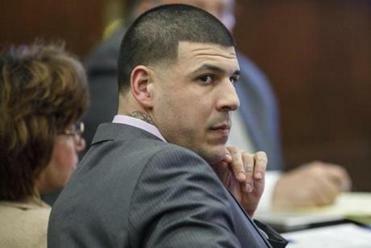 Both before and after his suicide, rumors and reports emerged about Hernandez’s sexuality. Media reports alleged that an inmate named Kyle Kennedy was involved in a sexual relationship with Hernandez. Because of the redactions, it is not clear whether those were the rumors he sought to dispel in the letters. The names of all other inmates mentioned in the letters are also redacted. In the second part of a “Dr. Phil” interview, Jenkins Hernandez said reports about Hernandez’s sexuality were embarrassing and hurtful. Kennedy’s lawyer, Larry Army Jr., has refused to address the nature of the inmates’ relationship except to say that they were close. At a news conference last month, Army Jr. said Hernandez and Kennedy had asked to share a cell. “So, please make this happen and I even prefer to move in with [redacted],” Hernandez wrote. “Me and him are very close and have been since the streets and that is FACT.” The words “very” and “FACT” were both underlined. Hernandez died in a single cell as Souza-Baranowski Correctional Center in Shirley. A spokesman for Kennedy’s lawyer did not immediately return an email Saturday. A lawyer representing Hernandez’s fiancee, Shayanna Jenkins Hernandez, declined to comment on the letters. In an interview with television’s Dr. Phil broadcast last week, Jenkins Hernandez said she had asked Hernandez about the rumors that he was gay, and he’d denied them. She said she’d never heard him mention Kennedy, and refuted claims that Hernandez had left him a suicide note. After his death, which the state medical examiner ruled a suicide, Hernandez’s murder record was vacated under a little-used legal maneuver known as abatement ab initio, which erases the convictions of those whose appeals are still open. He’d been acquitted following a separate double-murder trial just days before his death.